Empress Shizuka and Barsalai Shefali, separated by eight years of war and demons, are finally reunited but must work to reconnect across post-traumatic stress and survivor’s guilt, and Shefali’s pending death, in this high fantasy sequel to The Tiger’s Daughter. Eight years have passed since Shizuka’s wife, Shefali, left to capture the phoenix feather that would let her return to her wife’s empire. Shefali knows she has only months to live and instead of going to see her mother and family, she chooses to spend her time comforting and healing Shizuka. The empress has taken her empire from her uncle, but at no small cost. The battle against the black-bloods with an untrained army, her conscription into the service by her uncle in an effort to kill her, and the death of too many friends drives Shizuka into alcoholism. The bulk of the book is spent recounting various past events for Shizuka, particularly political events, and only occasionally moves into Shefali’s point of view (where the majority of The Tiger’s Daughter took place). This particular type of storytelling, along with the ending of the book being presented at the start and the narrative then being a recounting of past events, makes the first half of the book a slog. The lyrical prose of The Tiger’s Daughter morphs into repetitive, purple metaphor in The Phoenix Empress, and the plot takes entirely too long to emerge. Once plot elements outside the relationship between Shizuka and Shefali develop, the pacing picks back up. This is not to say that the interaction between the two women is not enjoyable or worth reading. The central tension of both books is the relationship between the two, and The Tiger’s Daughter showcases a nearly even balance of romance and high fantasy elements. The Phoenix Empress, on the other hand, segregates these elements instead of integrating them, making for a droopy, belabored first half and an action-packed back half. The book’s redemption comes in the second half of the book, in which the reader is treated to both Shizuka’s recounting of the war with the black bloods and her encroaching godhood, as well as Shefali’s more active attempts to understand her pending death. Shizuka’s battle with her uncle and the overtaking of the empire, as well, is compelling and well-paced, and the small amount of current events that occur in the last 50 or so pages, as Shizuka and Shefali decide whether to confront The Traitor (an evil god) directly or stay where Shefali might escape death, lead well into the future sequel. The momentum is almost enough to forgive the wandering and excessive first half of the book. Almost. In terms of detailing, Arsenault Rivera takes better care in The Phoenix Empress to avoid the problematic slurs that occurred in The Tiger’s Daughter. She also expands a portion of the worldbuilding by bringing in discussion of additional queer elements. Kasuri’s questioning of Shizuka’s virgin status will resonate with many queer women as an ever-present conversation. A major problem in The Tiger’s Daughter—the lack of other queer people in a fantasy world—is rectified in The Phoenix Empress in Shefali’s recounting of another lesbian couple (also gods) in Shur-Shur, and mortal homosexual couples, as well as nonbinary people, are presented as commonplace in Xian-Lai. At over 500 pages, the book still leaves some poorly answered questions. The freeing of Qorin comes at nearly the halfway mark of the book and while it marks the beginning of a tension build-up for the plot, the reasoning behind why Shizuka waits over eight years to do so remains mainly unexplained. It is a particularly problematic element, as Shizuka’s wife, Shefali, is Qorin, and the ruler of the Qorin people. If any group should have been forefront in Shizuka’s mind, it should have been the Qorin. 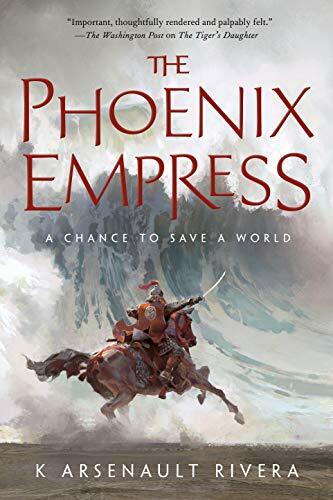 While many of the bigger issues that plagued the first book in the series are mitigated in The Phoenix Empress, the romantic tension does not carry the book in the same way as its predecessor. The book serves as an excellent set up for what appears to be a much more action-oriented third book, and the lesbian representation is excellent; however, readers may be hesitant to spend their time working through another slow set up among a sometimes culturally problematic backdrop. Those who loved The Tiger’s Daughter for its slow burn romance will find The Phoenix Empress a stirring, compassionate book. Those looking for more high fantasy elements in some sort of balance with the setting and characters may wish to look elsewhere.